Pros: Clean, usb plug is a big plus. Inexpensive for the SSD storage space. Cons: Does not work! Caused my MS 2003 server to crash with mysterious errors after install, even though this drive was not actually in use. (just plugged in). Would not format to its full size, it has 177MBs that will not format due to an unexplained drive error. It also did not come with a mini usb cable, the extra couple of dollars would not have hurt them to sell a complete product. The USB throughput peaked at 1MB/s, a little faster than my 32GB MLC flash drive. Other Thoughts: If I can ever get it to format properly, I might use it as a storage drive for non critical files. 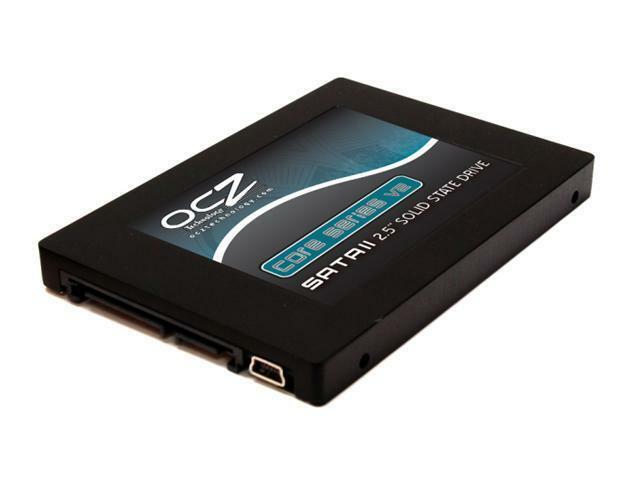 This is the only OCZ product that was "functionally DOA" out of the box, so hopefully it does not tarnish their name too much. I will now think twice before buying high ticket items from them in the future. Hello,we are sorry that you are having problems. Please visit our support forums at the link below for information on setting up these drives, and troubleshooting assistance. The solution could be as simple as a BIOS change. We are always happy to help. Cons: Poor performance, no after-sales support. It's advertised as being firmware upgradeable thru the USB port but it's basically a lie. Once you start using it you'll start having stuttering issues; when you go to their support forums to look for help and upgrades they'll tell you no upgrades are available or ever will be available. Other Thoughts: NewEgg should drop these products, they're unfit for use. Hello, we are sorry that you are having problems. The firmware on the Core 2 drive is upgradable, although we do not have any upgrades available. We have fixes for the most common issues on our support forums. We suggest that customers research the guides on our forums so that they are aware of what must be done to their particular Windows installation to make it suitable for use with an SSD before making a purchase. Cons: I Installed this drive into a Brand New Lenvo. Initially I thought it was starting and running faster, but as time went on, and outlook started to fill up, I began to notice distinct delays. The company was good to try and help, but we could not get it working. Hello, we are sorry that you are having difficulties. Most issues have to do with the OS not being set up properly for SSD drives. We are not sure exactly what is causing your specific problems, but perhaps it is a BIOS issue. We have a great amount of info available on our SSD support forums at the link below. Cons: Provides extreemly slow operation as a C-Drive using Vista. Really Really slow, slower than a 5400 RPM laptop drive. Other Thoughts: This was inserted in three different systems, a Intel 6800 system, an I7 system, and a laptop, and in each performance was horrible as a C-Drive using Vista. Check the return policy carefully before buying. 15 out of 21 people found this review helpful. Did you? Hello, generally this drive works fine with Vista. It's your hardware configuration that you are likely having problems with. We have workarounds for most issues. Please visit our support forums at the link below and visit the flash media section for tips. You can also post for personal help if you like.